Pop Art Minis: Sunday Sketches..."Esther B." 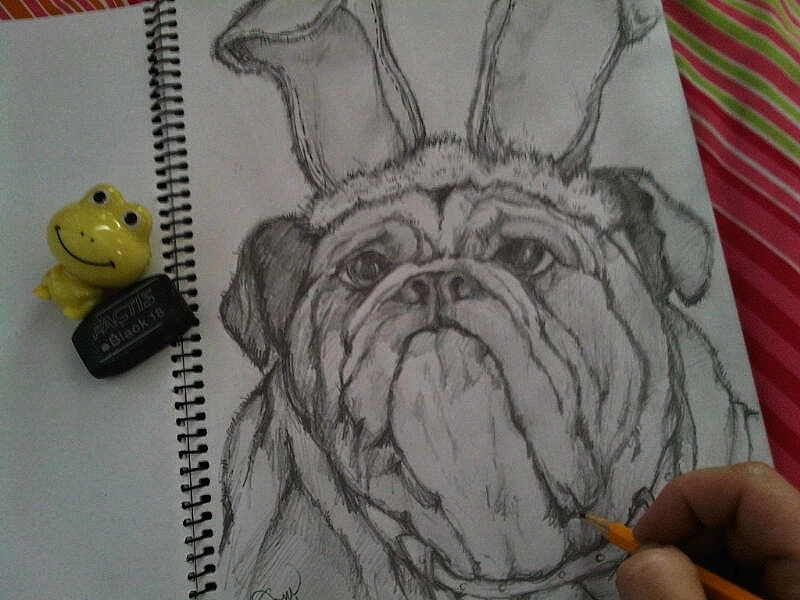 Bulldog...Bunny...Or Both? Sunday Sketches..."Esther B." Bulldog...Bunny...Or Both? I thought it would be fun to participate in some sketch time fun over at this awesome blog called Blue Chair Diary. 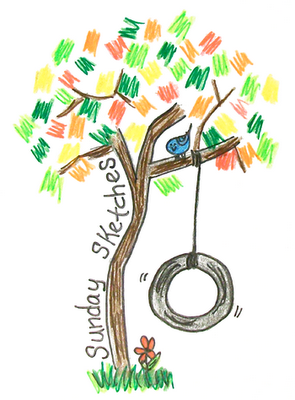 When Sunday rolls around it's time to submit your "Sunday Sketches" and if you haven't participated or checked out the Cool, Creative fun you really should...Inspiring for sure! And so with my mind made up to submit a sketch this week I used a friend suggestion from my Pop Art Minis Facebook Page (which by the way I'm working on a giveaway prize package to celebrate a fabulous friend milestone...so stay tuned for that) in deciding what the sketch would "B". So a big thanks Josh T. for inspiring me with this comment left on my wall! 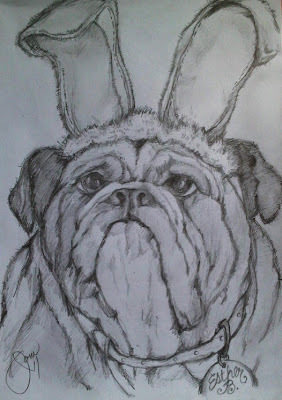 "You should draw a pug wearing bunny ears"! So here's my Pop Art Mini Sketch for this weeks Sunday Sketches submission. Not sure yet if I'll be adding "pops" of color...I'm kind of liking it just being a sketch and leaving it at that...what do you think? Or maybe I need to do a colorful version too. hmmm...I'm leaving it up to YOU! Sketch? * Color version TOO? Submitted Blue Chair Diary Blog - Sunday Sketches! I love, love, love this!!! Oh the bunny ears on top of that face... fantastic! Oh this is so fun! What a great sketch of the bull dog. Love the bunny ears, too!! Your blog is so fun, as is your art! Thanks so much Kristin and Heather...so glad you popped by and thanks for your awesome comments! LOVE IT! Aww such a cute dog. Love it! this is really well done! Thanks to all for your awesomely amazing comments! It's always fun for great peeps to pop in and comments are greatly appreciated! thanks again...you ROCK! This is just too adorable, that face is the face only a mother could love, and I am a mother. I am partial to graphite sketches, but it would look good colored also. Nice to meet you and look forward to seeing more of your art. hahahaa.. ok- that dog is funny. Your sketch has confident strokes and seriously good. :) I love you leave it like that but if you decide to color, I bet it'll look nice too. wow! adorable! I like it in black and white but also love to see her in color as well. Beautiful line work on this whimsical face. Although I am addicted to color, sometimes pencil just works better for effect. What a fantastically awesome drawing. Wonderful, the bunny ears just make it too cute! Oh my gosh that is too funny! Love the look on his face. Like he's thoroughly embarrassed by having to wear bunny ears. Priceless! oh he is so cute :) I like the sketch, it rather fantastic! I think it is INCREDIBLE just the way it is!!!!!!!! Oh my gosh, this is so stinking CUTE. I am guilty of sticking all kinds of things on my dog's poor noggin so I laughed out loud when I linked to your work. I adore his expression. Fun and original pet portrait! Thanks for the ss visit. What a wonderful imagination you have. Love it! Visiting and following via "What's YOUR BUZZzzz Wednesday Linky Party"
Thanks again to all for leaving such awesome comments! Love all of the suggestions for color or non-color! At this point still haven't added the pops of color, but I do believe that eventually will happen...just a few pops! Thanks again for "popping" by!